"Tilak" redirects here. For the Indian anti-colonial leader, see Bal Gangadhar Tilak. Right: A Shaiva Hindu with Tilaka (Tripundra). In Hinduism, the tilaka (Sanskrit: तिलक) is a mark worn usually on the forehead, sometimes other parts of the body such as neck, hand or chest. Tilaka may be worn on a daily basis or for rites of passage or special religious occasions only, depending on regional customs. The term also refers to the Hindu ritual of marking someone's forehead with a fragrant paste, such as of sandalwood or vermilion, as a welcome and expression of honor when they arrive. The tilaka is a mark created by the application of powder or paste on the forehead. Tilakas are vertical markings worn by Vaishnavites. The Vaishnava tilaka consists of a long vertical marking starting from just below the hairline to almost the end of one's nose tip, and they are also known as Urdhva Pundra. It is intercepted in the middle by an elongated U. There may be two marks on the temples as well. This tilaka is traditionally made with sandalwood paste. The other major tilaka variant is often worn by the followers of Shiva, known by the names of Rudra-tilaka and Tripundra. It consists of three horizontal bands across the forehead with a single vertical band or circle in the middle. This is traditionally done with sacred ash from fire sacrifices. This variant is the more ancient of the two and shares many common aspects with similar markings worn across the world. Shaktas, worshippers of the various forms of the Goddess (Devi), wear a large red dot of kumkum (vermillion or red turmeric) on the forehead. Chapter 2 of the Kalagni Rudra Upanishad, a Shaiva traditional text, explains the three lines of a Tilaka as a reminder of various triads: three sacred fires, three syllables in Om, three gunas, three worlds, three types of atman (self), three powers in oneself, first three Vedas, three times of extraction of the Vedic drink Soma. The first line is equated to Garhapatya (the sacred fire in a household kitchen), the A syllable of Om, the Rajas guna, the earth, the external self, Kriyā – the power of action, the Rigveda, the morning extraction of Soma, and Maheshvara. The second streak of ash is a reminder of Dakshinagni (the holy fire lighted in the South for ancestors), the sound U of Om, Sattva guna, the atmosphere, the inner self, Iccha – the power of will, the Yajurveda, midday Soma extraction, and Sadashiva. The third streak is the Ahavaniya (the fire used for Homa), the M syllable in Om, the Tamas guna, Svarga – heaven, the Paramatman – the highest self (the ultimate reality of Brahman), Jnana – the power of knowledge, the Samaveda, Soma extraction at dusk, and Shiva. These lines, states Antonio Rigopoulos, represent Shiva’s threefold power of will (icchāśakti), knowledge (jñānaśakti), and action (kriyāśakti). The Tripuṇḍra described in this and other Shaiva texts also symbolizes Shiva’s trident (triśūla) and the divine triad of Brahmā, Vishnu, and Shiva. The Vasudeva Upanishad, a Vaishnava tradition text, similarly explains the significance of three vertical lines in Urdhva Pundra Tilaka to be a reminder of Brahma, Vishnu, Shiva; the Vedic scriptures – Rigveda, Yajurveda and Samaveda; three worlds Bhu, Bhuva, Svar; the three syllables of Om – A, U, M; three states of consciousness – awake, dream sleep, deep sleep; three realities – Maya, Brahman and Atman; the three bodies – Sthula, Sukshma, and Karana. Different Hindu traditions use different materials and shapes to make the tilaka. Saivites typically mark their Tilak using vibhuti (ash) in three horizontal lines across the forehead. Along with the three horizontal lines, a bindu of sandalwood paste or a dot of red kumkum in the centre completes the Tilaka (tripundra). Vaishnavas apply a Tilak with vermillion, clay, sandalwood paste (Chandan), or latter two mixed. They apply the material in two vertical lines, which may be connected at the bottom, forming a simple U shape, often with an additional vertical red marking in the shape of a tulsi leaf inside the U shape. Their tilaka is called the Urdhva Pundra. See also Srivaishnava Urdhva Pundra, the Srivaishnava tilaka. Ganapatya use red sandal paste (rakta candana). Shaktas use kumkuma, or powdered red turmeric. They draw one vertical line or dot (not to be confused with Bindi used by Indian women from different religions). Honorary tilakas (Raja tilaka and Vira tilaka are usually applied as a single vertical red line. Raja tilaka will be used while enthroning kings or inviting prominent personalities. Vira tilaka is used to anoint victors or leaders after a war or a game. Swaminarayana tilaka is U-shaped in the middle of forehead along with the red dot in the middle of U (known as chandlo). 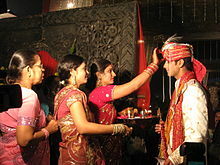 Applying Tilaka on the forehead of guests to welcome and honor is a cultural tradition in India and Nepal. Sikhs apply the tilaka as well. The Darshan Darbar devotees apply red tilaka to the forehead. This tilaka is a long red mark veritically applied. Saint Baba Budha ji applied tilaka to the first five Sikh Gurus. Jains use Tilaka to mark the forehead of Jaina images with sandalwood paste, during Puja ceremonies. Christians in India use Tilaka, both to mark special occasions and during their worship rites. Hindus use the Tilaka ceremony, as a mark of honor and welcome to guests, something special or someone special. It may also be used, for same reason, to mark idols at the start of a Puja (worship), to mark a rock or tree before it is cut or removed from its original place for artisan work, or a new piece of property. The choice of style is not mandated in Hindu texts, and it is left to the individual and the regional culture, leading to many versions. The known styles include Vijayshree – white tilaka urdhwapundra with a white line in the middle, founded by Swami Balanand of Jaipur; Bendi tilaka – white tilak urdhwapundra with a white round mark in the middle, founded by Swami Ramprasad Acharya of Badasthan Ayodhya; and Chaturbhuji tilaka – white tilak urdhwapundra with the upper portion turned 90 degrees in the opposite direction, no shri in the middle, founded by Narayandasji of Bihar, ascetics of Swarg Dwar of Ayodhya follow it. Sharma has named additional styles as, Vallabh Sampraday Tilak, Sri Tilaka of Rewasa Gaddi, Ramacharandas Tilaka, Srijiwarama ka Tilaka, Sri Janakraja Kishori Sharan Rasik Aliji ka Tilaka, Sri Rupkalajee ka Tilaka, Rupsarasji ka Tilaka, Ramasakheeji ka Tilaka, Kamanendu Mani ka Tilaka, Karunasindhuji ka Tilaka, Swaminarayana Tilaka, Nimbarka ka Tilaka and Madhwa ka Tilaka. In Nepal, Bihar and other regions, the tilakam is called a tikā/teeka (टिका [ʈɪkaː]), and is a mixture of abir, a red powder, yoghurt, and grains of rice. The most common tikka is red powder applied with the thumb, in a single upward stroke. Madhvacharya depicted with Angara Akshte tilaka. Tilaka markers are also worn on chest and arms. ^ a b Deussen, Paul (1997). Sixty Upanishads of the Veda. Motilal Banarsidass. pp. 789–790. ISBN 978-81-208-1467-7. ^ V. S. Apte. A Practical Sanskrit Dictionary. p. 475. Entwistle, A. W. (1981). Vaishnava tilakas: Sectarian marks worn by worshippers of Vishnu (IAVRI bulletin). International Association of the Vrindaban Research Institute. Mittal, Sushil; Thursby, Gene R. (2006). Religions of South Asia: An Introduction. Taylor & Francis, United Kingdom. ISBN 0-415-22390-3. pp. 73. Wikimedia Commons has media related to Tilak.